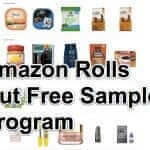 If you have ever been on the receiving end of an Evite invitation, you know that once your ‘friend’ gives your email address to Evite (almost always without asking you first) you will receive an endless stream of spam (it’s spam because you did not request it, let along give them permission to put your email address on their mailing list) from Evite, seemingly with no way to opt out of it (making it a violation of Federal law, but apparently Evite doesn’t care about that). 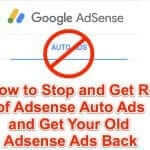 Here is out to opt out of Evite notifications and other Evite spam. The first, and very annoying, thing that you have to do is actually register for an Evite account. The very fact that you are forced to register for an Evite account in order to stop Evite from sending you email that you didn’t ask for in the first place gives Evite a permanent spot in our “spammers we’d like to see hung in the village square” list, but, alas, that won’t stop the Evite spam. So, go ahead and register for the damn Evite account. Once you have registered and are logged into the Evite site, find the icon for your account – it will likely have your initials in a circle. Click on that circle, which will give you the account drop-down menu. Select ‘SETTINGS’. 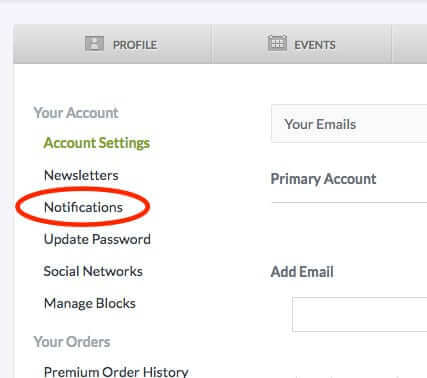 Now, once you are in the settings area, you will see settings for both ‘Newsletters’ and ‘Notifications’. You would probably think that going to the Notifications area would be where you would opt out of those pesky email notifications. And, you would be wrong. 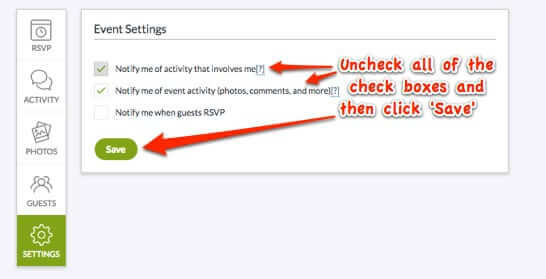 As a guest, if your host has opted to leave the invitation’s activity feed public, you will receive periodic emails when other guests have made activity on the feed. The activity feed is a private social feed that allows hosts and guests to interact with each other. Some of the activity feed interactions that can trigger these emails are: guest comments, photo uploads, interaction with the host-created various widgets, etc. If you would like to stop these emails, you can simply access the invitation and click the “Settings” tab and use the checkboxes to disable the email notifications. These emails are different than our marketing/promotional emails, and are only being sent to you as a result of your interaction with the invitation. 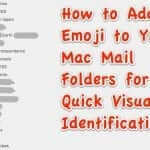 If you wish to stop these specific emails, you will need to do so using the instructions above. However, before you go to that next step, while you are still in the settings area, click on the ‘Newsletters’ section. 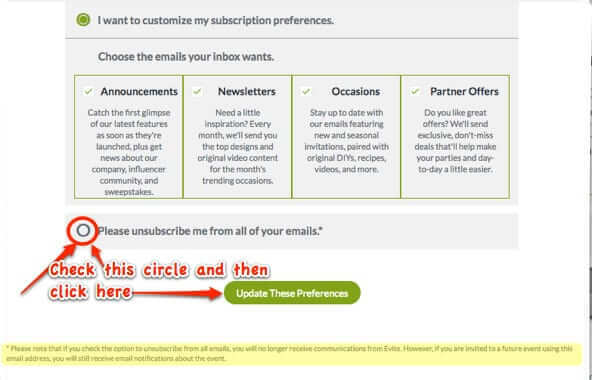 Here you will note that you are almost certainly “currently subscribed to Evite emails”. So, while you’re there, click on “Change Settings”, and remove yourself from all of their other emails. In other words, you can check out any time you, but you really can never leave. So, exactly how can you stop mailings once someone decides to give up your email address to Evite for their event? If you are willing to do it on a per-event basis, you go to the specific event, select ‘SETTINGS’, uncheck the oh-so-helpfully (not) pre-checked boxes, and save your changes. 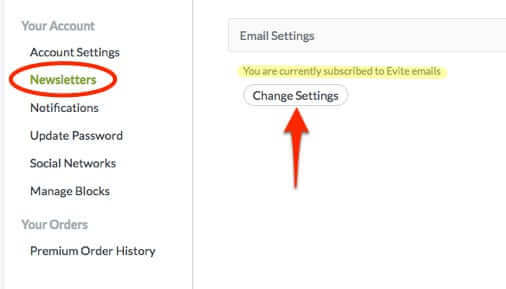 If you don’t want to have to opt out of every single notification for every single Evite event for which your friends have helpfully signed you up, you can do like we do, and create a rule in your email client to simply delete anything from Evite, with extreme prejudice. 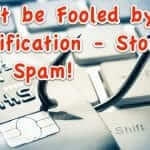 If you have ever been on the receiving end of an Evite invitation, you know that once your 'friend' gives your email address to Evite (almost always without asking you first) you will receive an endless stream of spam (it's spam because you did not request it, let along give them permission to put your email address on their mailing list) from Evite, seemingly with no way to opt out of it (making it a violation of Federal law, but apparently Evite doesn't care about that). Here is out to opt out of Evite notifications and other Evite spam. Next Do I Have to Worry About the Intel Chip Security Flaw? And What is Speculative Execution? I truly feel you, Sara, as I just had someone give up my carefully guarded and uber private cell phone number to evite.com. To say the least… I was quite–furious. So, this is what you can do–sooner than later. Save Evite’s reply, in the future event that you need to hold their toes to the flames due to violating your Opt-Out request. Are there any similar invitation services that don’t sign up invitees for their spam? Thank you. This will be most helpful in other places probably.